There is something to be said about a name. Epic Ales and its brewpub Gastropod nailed the bulls-eye. With unique craft beers and tasty local dishes, this south Seattle brewery and gastropub is an experience. A trip to Epic Ales is meant to be enjoyed and shared with others. With creative flavor combinations in the beer and food and low-key atmosphere, Tim and I had a blast during our recent visit with Tim’s sister and brother-in-law. 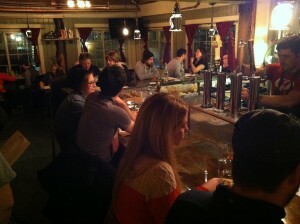 Opened in 2009, Epic Ales Gastropod (3201 1st Ave. S.) has a strong following around Seattle. This means it can get busy, especially on weekends. The brewpub is also small. Our party did a little research before hand and decided to show up early. We had no problem getting a table. It was a different story for all the other people who were waiting in line as we left. An IPA brewed by Epic Ales. The brewery is constantly brewing up different flavors and unique recipes, which means you have the potential of having a different experience every time you visit. Tim’s sister and I really enjoyed their sour-beers (Partytime!!! and Salty Ghosts) while Tim and his brother-in-law loved all the IPAs. 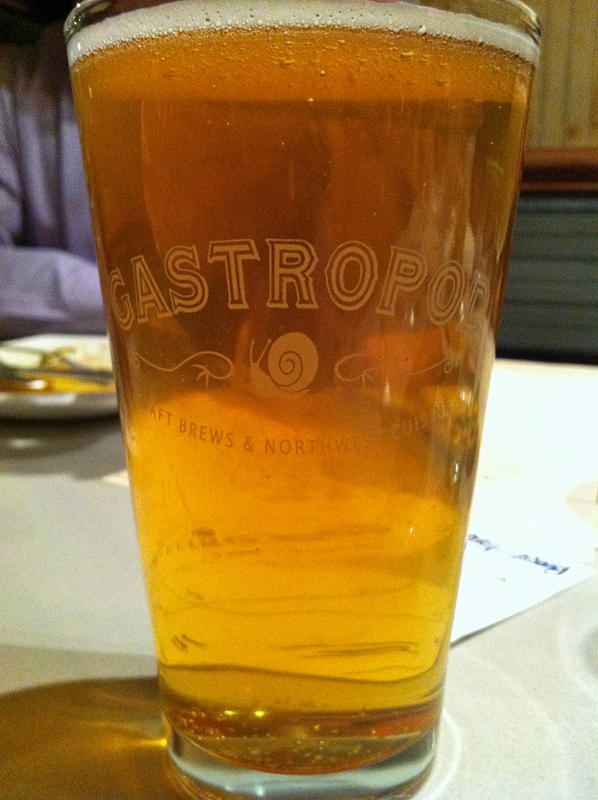 Epic Ales Gastropod also offers a slew of brews from across the Northwest. 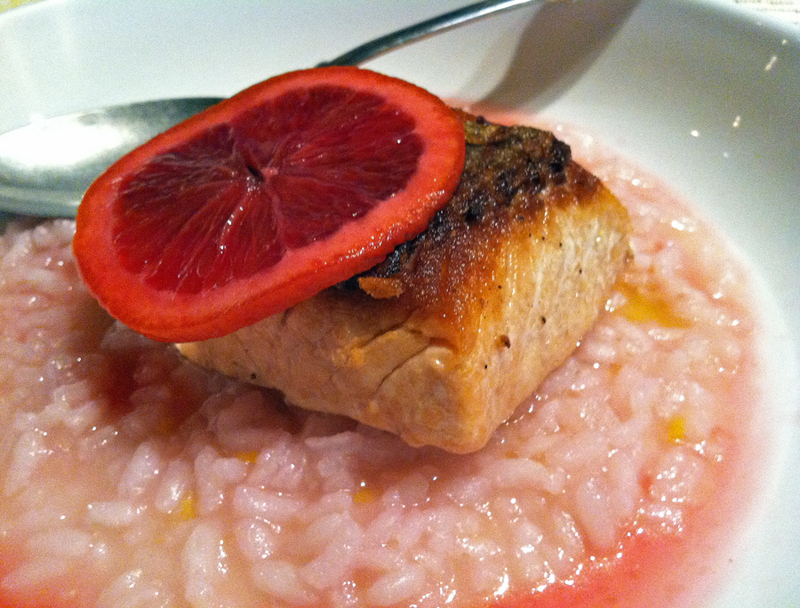 Wild steel head with blood orange risotto and pickled blood orange. In addition to some really unique beer creations, Epic Ales Gastropod makes some incredible food. Eating there is intimate. The kitchen is small (we’re talking the size of a typical house kitchen) and many of the tables offer a view of the chefs at work. Plates are meant for sharing, which is how Tim and I prefer to eat a meal anyway. As I read the descriptions of each option on the menu, a few flavor combinations popped out and had me wondering how they even come up with that? They must view their food like they view their beer- anything is possible. Steamed honey mussels with saffron, crosnes, kumquats and rosemary. We ordered the shaved brussels sprout and herb salad, decked with a pineapple mustard vinaigrette, prosciutto chips and hazelnuts; the steamed honey mussels flavored with saffron, crosnes, kumquats and rosemary; the okonomiyaki (think Japanese pancake) cooked with carrots, cabbage, onion, pork belly, tomatoes and kewpie; and the wild steel head with blood orange risotto and pickled blood orange. 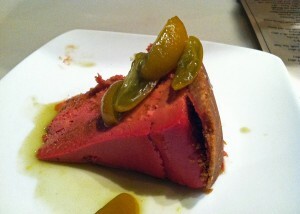 We ended the meal with sweet beet cheese cake which is topped with candied basil kumquats. Sweet beet cheese cake with candied basil kumquats. We loved everything we tried, but we can’t gaurentee it will all be on the menu when you visit. 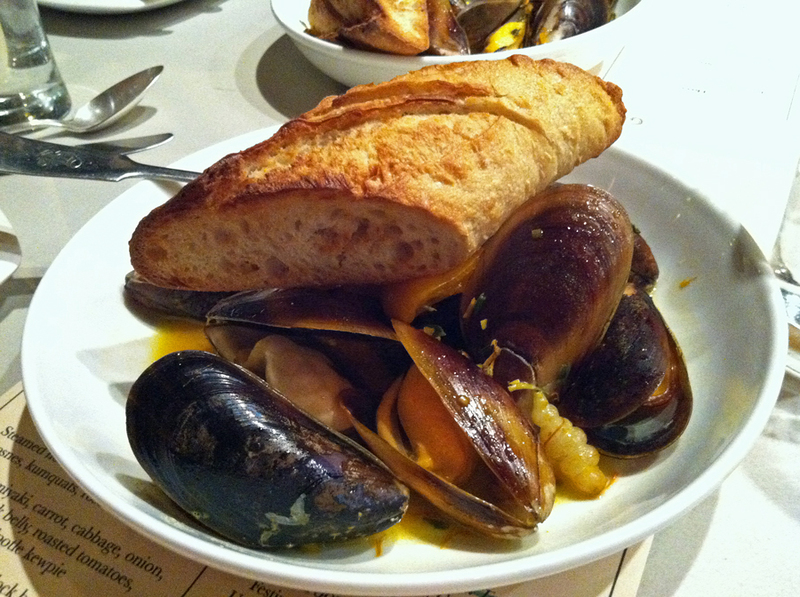 Epic Ales Gastropod makes seasonal plates, so their menu is always changing. However, I don’t think you can go wrong if you’re looking to find something created from pure imagination and fun. I’d recommend ordering everything at once, rather than ordering one plate at a time. The kitchen can only work so quickly with a small space and busy crowd. This isn’t such a bad thing though, as it’s nice to not be rushed and have time to enjoy yourself and your company. Open Tuesday-Sunday from 4-10 p.m., Epic Ales Gastropod will leave you with a epically unique experience. Have you ever had an epic experience at Epic Ales Gastropod? We’d love to hear about it. Please leave a comment below or connect with us on Twitter, Google+, and Facebook. 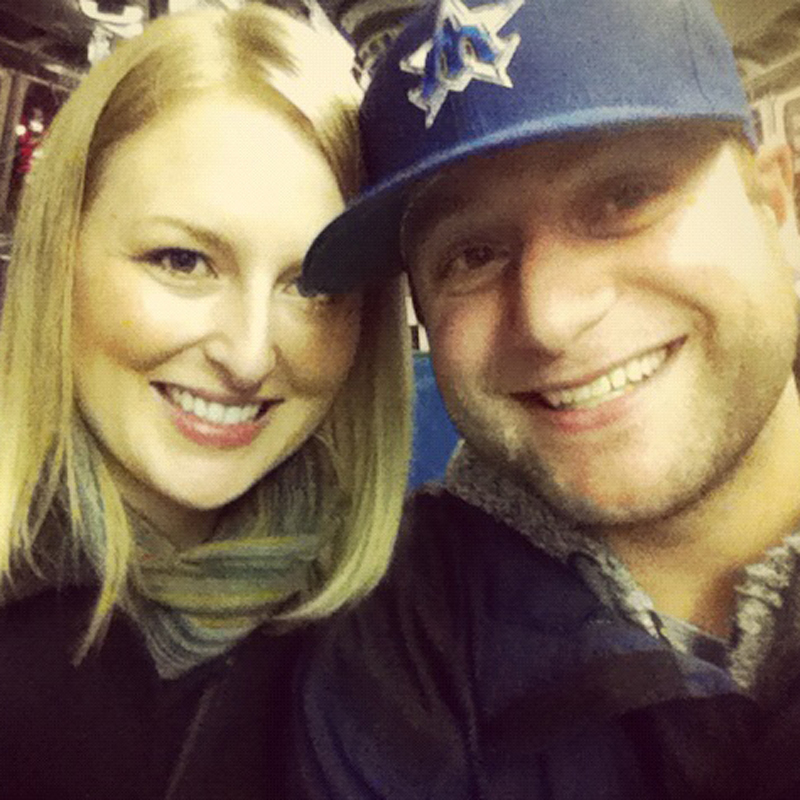 You can also check out Seattle Bloggers for more great places to eat around Seattle.